What is the Wild Coast Project? More than 3m tonnes of earth was brought by boat from the tunnels and shafts created by the Crossrail scheme in London. 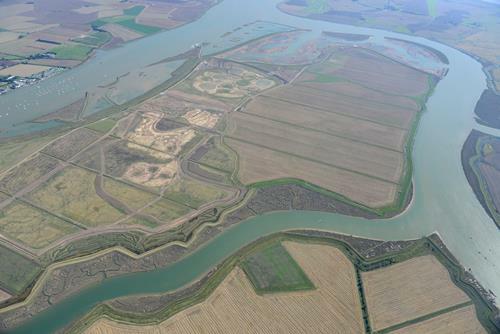 This allowed RSPB to raise the land above sea level and place the soil in way that created a new 115ha intertidal area of saltmarsh, islands and mudflats (known as Jubilee Marsh). Wallasea Island sits within an SPA which covers the Crouch and Roach estuaries and which is special for overwintering waders and wildfowl including Brent geese. Their work increases the habitat for these birds both whilst roosting and feeding as well as create new grassland areas (wet and dry). The intertidal areas have been designed with climate change in mind, with long shallow slopes from the new seawall providing space for the saltmarsh to creep up as sea levels rise. Currently RSPB are in the process of completing a series of shallowly flooded saline lagoons in the southern part of the island to attract over wintering waders and wildfowl and in the summer nesting birds such as avocets, little ringed plovers and hopefully black-winged stilts. Discover the beauty of Wallasea Island here by watching RSPB’s latest video! 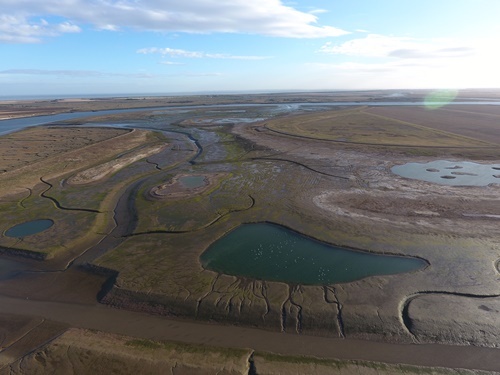 The reserve covers more than 740ha, with two thirds of the reserve now transformed from arable farmland to saltmarsh, mudflats, lagoons and grazing marsh. There are three walking trails – Jubilee Marsh, Allfleets Marsh and Marsh Flat. So far the reserve has added a further 7km of trail to the reserve in its creation and more will be created in the future. At the ends of Allfleets Marsh trail and Jubilee Marsh trail are two shelters providing a comfortable place to sit overlooking the river. There are no facilities on site at the moment but we do hope that in time we will add a reception hide to welcome visitors. There is a bike shelter which displays posters and information on upcoming events and about RSPB Wallasea Island. Benches and visitor hides can be found at several points within the reserve. The sea wall footpath which runs along the northern side of the reserve along the River Crouch, providing uninterrupted views to the north of the river, is open at all times. The reserve itself is open at all times between 8am and 8pm or dusk, whichever is earlier. Where is Wallasea Island and how can I get there? The reserve is free to enter. There is a small surfaced car park and all trails are grass paths. SatNav users should use the nearest postcode – SS4 2HD – then follow the brown tourism signs. From the historic market town of Rochford take the Ashingdon Road until you see the brown tourism sign at Brays Lane and follow these to the RSPB Wallasea Island Wild Coast. Parking is free and there are designated disabled parking bays. The nearest train station is in the market town of Rochford on the London Liverpool Street to Southend Victoria line and takes 50 minutes. The reserve is 6.6 miles (10.5 km) away. The nearest bus stop at Loftmans Corner is in the village of Canewdon which is about two miles (3.2 km) from reserve. Stephensons Bus Route 60 runs from Southend on Sea through Rochford to Canewdon. On foot from Loftmans Corner head east away from Canewdon onto Creeksea Ferry Road. Continue along this road onto Island and to reserve entrance. Bike The reserve is 6.6 miles (10.5 km) away from Rochford and 7.3 miles (11.7 km) from Hockley. There is a bike shelter at the reserve. The reserve can be accessed across the River Crouch via the passenger foot ferry from Burnham on Crouch. The scheduled ferry service between Wallasea Marina and Burnham runs from Easter (Good Friday) to the end of September, six days a week (not Wednesdays) between 10.00 and 17.00. It is operated as an 'on demand' service by phoning 07704 060482. London Southend Airport lies close to the market town of Rochford. Can I walk my dog on Wallasea Island? Dog are not permitted on the island as it is a reserve for important bird species and other wildlife. How can I keep up to date with the latest news?